‘Revolutionary Road’ – Richard Yates 1961. Richard Yates must have had some truly destructive relationships in his life. No one could write with such melancholy about the disintegration of relationships without having experienced this kind of destruction. While doing some research into Richard Yates I found this statement he made about his life’s work, and I think it explains a lot about the tone of both the novels I have read by Yates (‘Cold Spring Harbor’ and ‘Revolutionary Road’): “If my work has a theme, I suspect it is a simple one: that most human beings are inescapably alone, and therein lies their tragedy.”‘Revolutionary Road‘ has so many similarities to ‘Cold Spring Harbor‘ that I even considered writing about them together. 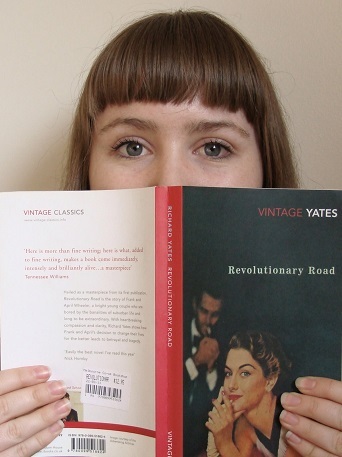 So if you would like to read about the sadness, frustration and desperation which permeates Yates’ writing you can read about it here, as it applies fully to ‘Revolutionary Road’ but I would like to avoid repeating myself. ‘Revolutionary Road’ is the far more famous novel, owing almost entirely to the success of the film adaptation starring Leonardo DiCaprio and Kate Winslet (which I have not yet seen). But it is also a far more enjoyable book to read. It has drama and intrigue, and a lot of plot progression and character development, all things which ‘Cold Spring Harbor’ was lacking. Oddly the cast of characters is not as strong, but there are a few unexpected delights, such as the real estate agent’s husband who tolerates his wife’s inane chatter by turning off his hearing aid at night. The main story is about Frank and April Wheeler a married couple with two young boys. Frank commutes to a dull desk job which he considers a joke, and imagines he undertakes ironically. April is a housewife, but dreamt of being an actress before her marriage. The the novel opens with scenes of an embarrassing terrible local amateur theater production she is starring in. This is significant as the argument the couple has afterwards starts a chain of decisions which leads to; a decision to move to Paris, infidelities by both parties, an attempted abortion, and a death. The setting is a vivid portrait of 1950s suburban America, and the relationship between April and Frank feels real, with very natural dialogue between the two. The thread throughout is a lesson to be learnt; being be honest with yourself is just as important as being honest with others. I did enjoy reading this book, despite the very depressing overtones. If you are interested in 1950s suburbia, or want to read a novel with excellent dialogue, or even just a novel which deals frankly with the realities of lives filled with disappointment, then this might just be for you.